Christian Dior (1905-57) launched his couture house on 12 February 1947 and became an overnight sensation. His voluptuous first collection featured hand-span waists above enormous skirts. It was christened on the spot by Carmel Snow, editor of American Harper's Bazaar, as the 'New Look', and was the antithesis of masculine wartime fashions. This jacket demonstrates the exaggerated New Look silhouette. 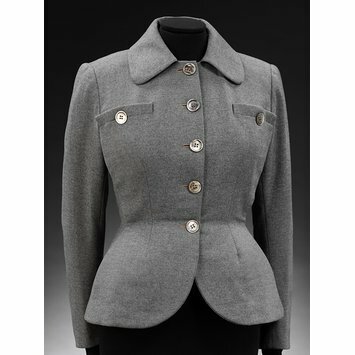 The jacket is moulded into an hourglass shape, which is helped by wads of padding and horsehair around the front of the hips. The shoulders are rounded, the bust full, and the waist tiny. 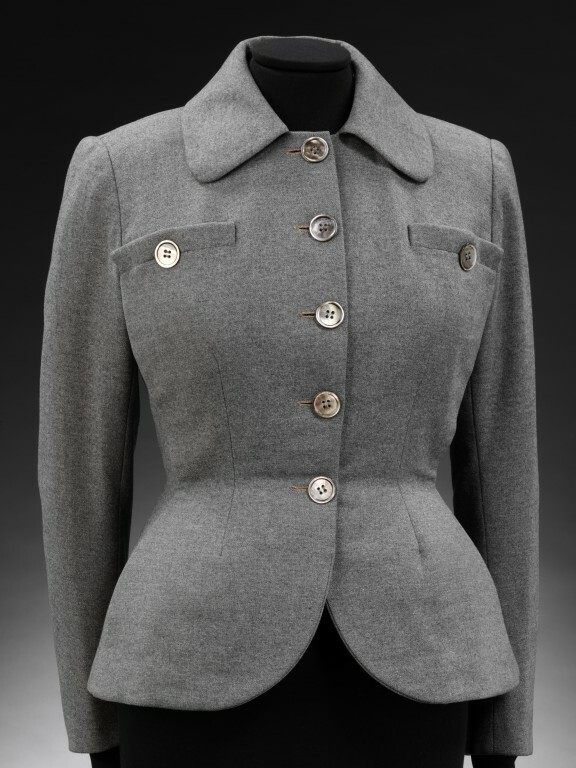 Grey wool flannel jacket with a fitted waist, and single breasted with a double breast pocket detail. The panels at the front of the jacket transform into the bust pockets. Rounded collar and rounded peplum. Opal Holt was born in Canada in 1887 but lived in the US until the end of the Second World War. She travelled extensively between the wars and was in the first plane to land in Bali. She married Herbert Holt, a Canadian who lived a large part of his life in England, as her third husband in 1946. They came to England and Europe every summer and Opal Holt began buying clothes in Paris for her life in England, and for the Bahamas in Winter, over a period of about thirty years. She died in 1980. Given by Mrs D.M Haynes and Mrs. Clark (nee Holt; Opal Holt's step-daughters).